Through Faith Direct you can make all of your contributions to St. Therese Church (and School) via automatic payments from your checking account or credit card--just as you may do now with your mortgage, household bills, and other monthly payments. This is a great way to simplify your giving--as well as being very cost-effective and environmentally-friendly. The first step is to enroll in the program. To do so, click on the the picture logo below. You will then be taken to the Faith Direct website. During your enrollment, you may choose from weekly donations, monthly donations, school donations, special collection donations, or one-time gifts. 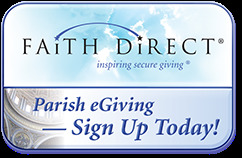 Once you're enrolled, for future visits, click on the button below (DONATE NOW) to get to the Faith Direct log-in page.